The battle lines have been drawn. On one side are the protesting villagers of a far-flung village in Uttar Pradesh and on the other is a huge deployment of security personnel. Alarmingly, while the police personnel have been instructed to use only rubber bullets and 'mild force', the protestors are armed with country-made pistols, licensed rifles and army guns. The battle, which has been brewing for over five months, has already resulted in the death of two police personnel and two villagers. Scores of others have been left injured, some with serious bullet injuries, including top administration officials. "Eight of my men have sustained bullet injuries. There are many others who have sustained serious injuries after being beaten with hockey sticks. Some 30 villagers had attacked one of my constables, who is fighting for his life in a hospital here. 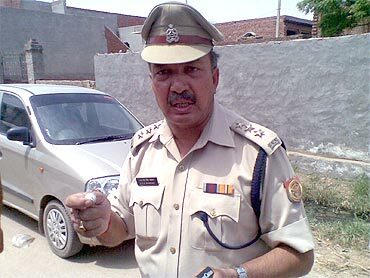 I myself have sustained bullet splinter injuries," said UVS Khokar, circle officer of Gautam Budha Nagar district. Even the police have stayed away from Bhatta Parsaul village, which lies very close to the under-construction F1 circuit and Sports City in Greater Noida, because of the relentless violence. 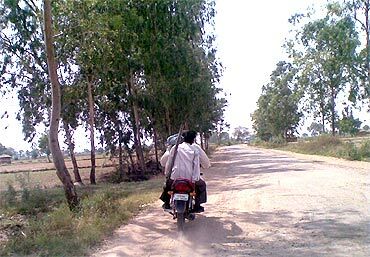 As rediff.com took the un-tarred road to the village, concerned villagers from neighbouring Dhankaur village warned us not to go there. "They will burn your car," warned Harish Sharma, owner of a tea stall, when we asked for directions to the village. 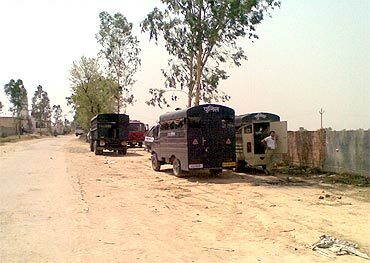 Scores of security personnel -- from the UP police, the Rapid Action Force and the Provincial Armed Constabulary -- lined the narrow road leading to the village. 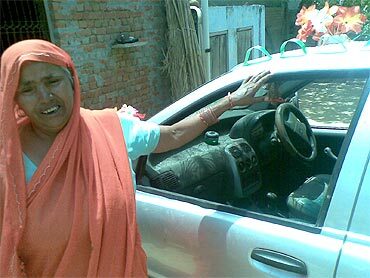 A check-post had been set up nearly one kilometer from the village and policemen searched each vehicle. "The village was off-limit even for us. When we approached the area, villagers would just say that police are not allowed and many of my men would back off," Khokar said. The policemen had backed off because of good reasons. The area had witnessed repeated instances of administration officials being kidnapped and beaten up. Tewatia a criminal or a hero? The first sign of trouble was detected on January 17. Thousands of farmers, led by one Manvir Singh Tewatia, staged a dharna to demand better compensation for their land acquired by the UP government for the proposed Rs 7,739 crore Yamuna Expressway. While the police claim that Tewatia is a criminal with an agenda, the villagers hail him as their hero. They also demanded a share in the land after the development. Though minor clashes were reported, nobody was hurt seriously in this dharna. On February 22, the villagers clashed with the PAC personnel, resulting in severe injuries to both parties. The villagers allegedly abducted a PAC sub-inspector and took away his light machine gun. On March 27, Deputy Director of Agriculture Dhurendra Kumar and Deputy Director AK Verma were held hostage by the villagers of Bhatta. The villagers only freed the duo 24 hours later, after the police agreed to release 12 farmers who had been arrested on charges of rioting on February 22. Speaking to rediff.com, Kumar recalled, "It was scary. The villagers beat me up and kept changing my location so that the police could not track them." The situation took a more violent turn over the last weekend. Last Friday, some men, allegedly led by Tewatia, took three men hostage. 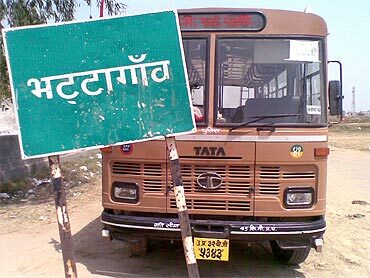 They were Uttar Pradesh State Road Transport Corporation engineers Durgesh Bhardwaj and Niranjan Das and their driver Jitender, who had gone to Bhatta to conduct a survey to consider the possibility of extending the state bus transport service to the area. Talking about the abduction, CO Khokar said, "The agitators just took them hostage. It was on my insistence that the UPSRTC officials had gone to the village to conduct the survey. I had told them that the village was completely cut off from the rest of the city and that the three-wheelers that ply in the area put the lives of the villagers at risk". "The villagers first kept the kidnapped trio in a temple. When we tracked them down, they moved to a ware house. We succeeded in tracking them again. 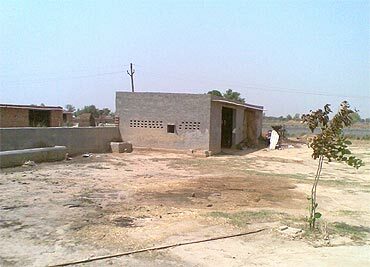 They finally hid the kidnapped men in an empty house (of one Ramesh Chandra) in the interiors of the village. Gunfire was exchanged and four people were killed before we finally rescued them," he added. In the gun-battle, District Magistrate Deepak Aggarwal sustained a bullet injury in his leg and a bullet pierced the shoulder of Senior Superintendent of Police S N Singh. The three-hour long gun-battle ended at 6 pm. Two PAC constables, Manvir Singh and Manohar Singh, and two farmers, Rajveer Singh and Kalu Singh, were killed. Constable Anirudh Singh, who was injured by a bullet during the clash, told rediff.com, "The villagers were very violent and they did not hesitate to open fire. Surprisingly, they had access to a lot of guns and ammunition. We, on the other hand, were allowed to only use mild force. We had to make use of rubber ammunition and lathis, while they attacked us with stones, bullets and hockey sticks." Where are the villagers getting arms and ammunition from? "Some of the villagers have licensed arms and some ex-army men have their service guns. Some guns have been procured from Kashmir and some of them are country-made pistols, easily available in western UP," explained CO Khokar. To make matters worse, these villagers have snatched away the guns of some policemen during these clashes. 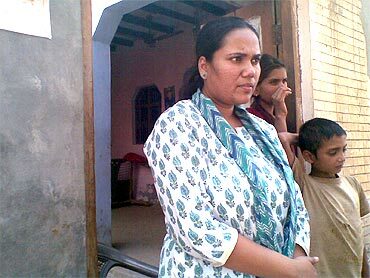 Acting District Magistrate Sheetal Verma said, "In an attack on the policemen, the villagers had looted an SLR, a turbine and a rifle. They have access to so many weapons, it is unbelievable. During the raids conducted in the village, we have recovered nearly 50 weapons and live ammunition." Verma, who had been posted in the area since February, said that no development work has been carried out in the area for the last five months. But she blames the villagers for the situation. "Summers are here and we have not been able to install even one hand pump. When we went there, they would just threaten us. Some of us would not dare venture there because of the abductions that have taken place. The villagers did not want the administration to go there because they were harbouring a wanted fugitive for the past five months, who has been orchestrating this whole agitation," Verma said. Verma is referring to the man leading the farmers -- Manvir Singh Tewatia -- who hails from Bhulandshehar. According to the district administration, Tewatia is wanted in over 20 criminal cases. The authorities have also declared a reward of Rs 50,000 for information leading to his arrest. "He has been staying in this village for the past five months. He does not own any land in the Yamuna Expressway region but has been inciting the villagers who actually do own land to protest against the acquisition. He and his associates, Premveer and Neeraj Malik (there is a reward of Rs 15,000 for each) and Gaje Singh, Kiranpal and Manoj (Rs 10,000 each) provide the necessary arms and ammunition to the villagers," CO Khokar said. The villagers, meanwhile, claim that the police have ruthlessly cracked down on the agitating farmers. They allege that the police have "kidnapped" 150 men from Bhatta Parsaul. 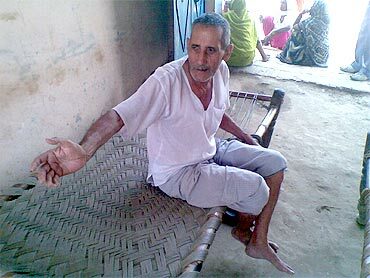 Mukat Lal Sharma, 72, a farmer, alleged that his son, Inderjit, was beaten up and taken away by the police on May 7. He has not heard from his son since. "He had just returned after a driving assignment. 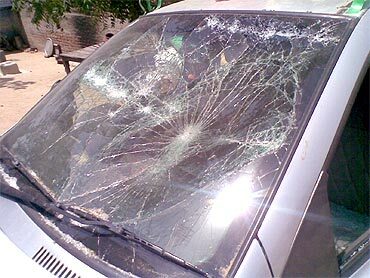 His brand new car was smashed up by the police and he was dragged out. They beat him up. When my wife and I tried to stop them, they beat us up," Sharma says. Pointing to lathi marks on her hands, Sharma's wife Asha says, "They set fire to our harvested maize crop and let loose our buffaloes, two of which are still missing. My son had nothing to do with the protests; he was picked up just because he was an able bodied man". On the same day, the police had allegedly picked up Navratan Sharma, 45, and his son Sachin Sharma, 17, from their house. Sharma and his son were on their way back from their fields when they were taken away. "Some 30 policemen pounced on them when they came back and took them away. We pleaded with them, saying they had nothing to do with the violence, but the police beat us up and smashed things in our house," Sharma's daughter Shivani said. In the crackdown after the violence, 27 different police teams had rounded up 32 villagers from the area. Of these, claim the police, some villagers have been formally arrested while others are being interrogated.